Welcome to another episode of Wildstorm Addiction! Joe David Soliz and Ben Murphy bring you Wildstorm reviews and news for the weeks of October 27th , November 3rd and 10th 2010. Reviews including Wildcats #28, Dv8: Gods and Monsters #8 (of 8), the Authority #28, and Welcome to Tranquility: One Foot in the Grave #5! 00:00:35 – Ben welcomes everyone to Episode #19 for the weeks of October 27th, November 3rd & 10th 2010. 00:00:47 – Spoiler alerts warning, but all the written Wildstorm reviews at the site are spoiler free unless otherwise noted. 00:01:25 – Joe gives a special shout out to Doctor Funk and apologizes for missing him at Wizard World Austin. Joe gives us a quick brief on the con. 00:02:40 – Joe reviews Wildcats #28 written by Adam Beechen with art by Tim Seeley and Andy Smith along with a cover by Dave Gibbons and Kevin Nowlan. 1:10 variant cover drawn by Andy Park. 00:09:27 – Ben muses about Wildcats #28 and where the next two issues may be going. 00:10:53 – Ben reviews the final issue of Dv8: Gods and Monsters #8 written by Brian Wood, art by Rebekah Isaacs, and cover by Fiona Staples. 00:17:07 – Ben quotes Brian Wood on some questions about the ending of Dv8. 00:19:01 – Joe gives his take on Dv8: Gods and Monsters #8 and the series as a whole and he isn’t buying it. And boy does he lay out some good reasoning for his argument. 00:24:43 – Joe reviews the Authority #28 written by Tom Taylor and art by Al Barrionuevo and cover art by Tim Seeley and Allen Martinez. 00:30:50 – Ben has something to say about penultimate issue of the Authority. 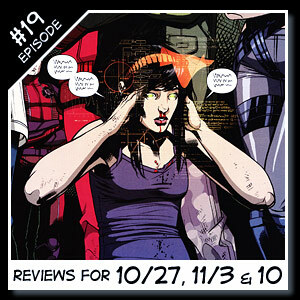 00:33:30 – Ben reviews Gail Simone’s amazing Welcome to Tranquility: One Foot in the Grave #5. Art by Horacio Domingues and cover by Neil Googe. 00:43:24 – Joe has some things to share on Welcome to Tranquility as well. 00:46:14 – Joe gives you both the print and digital Wildstorm Releases for the weeks of 10/27, 11/03, and 11/10. 00:49:16 – Ben gives you are contact info which you will find below and says good night. The opening and closing music is “Universal Domain” by Dreamline which can be found athttp://www.musicalley.com. This entry was posted in Podcast and tagged authority, dv8, podcast, welcome to tranquility, wildcats. Bookmark the permalink.